Home / Sewing tips / Fusible interfacing : woven or non-woven ? Fusible interfacing : woven or non-woven ? 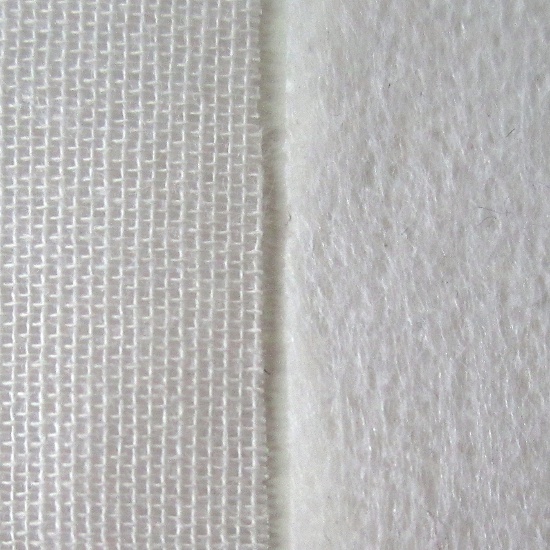 You can find two different kinds of fusible interfacing : woven and non-woven. What are the differences between the two? Is one better than the other? Here is an article that, I hope, will enlighten you on the subject. When you start sewing, interfacing is not the primary concern, and beginners tend to ignore it completely. But when advancing, you’ll quickly realize that this is a necessary supply to stabilize some areas of your sewing projects and get neat finishes. I’m shouting out loud my love of interfacing: interfacing is glamorous! So today I’ll be talking about the two main types of fusible interfacing: woven and non-woven. The woven kind is a cotton fabric with one side (the rough one) primed with fusible glue. The non-woven kind consists of agglutinated and compressed fibers and one side (the rough one) is primed with fusible glue. As a result, the woven fusible interfacing looks and behaves like fabric and the non-woven looks and behaves like a sheet of paper. Woven : G700 (medium), G710 (light), G785 (stretch). Non-woven : H200 (medium), H180 (light), H608 (stretch). The woven interfacing must be cut as fabric would : respecting the grainline. The non-woven interfacing can be cut “as it comes”, in any direction. So the non-woven is easier to cut and as it can be cut in any direction, regardless of the grainline, nothing will go to waste. A fabric fused with a woven interfacing will continue to behave like fabric. It will keep a “natural” drape and hand. A fabric fused with a non-woven interfacing will look stiffer. 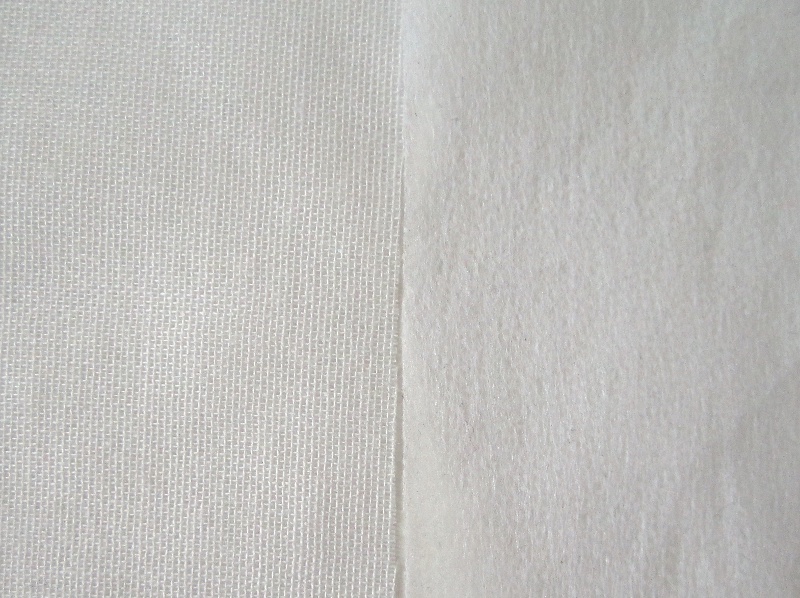 In my experience, if the non-woven was not perfectly applied, and sometimes even if it was applied properly, crinkles and creases will appear on the right side of the fabric. Whether visually or by touch, the woven fusible interfacing always looks and feels better. The non-woven fusible interfacing is usually cheaper than the woven kind, especially if you buy “brands.” In France, I often buy woven “generic” (unbranded) fusible at 3 euros per meter : cheaper that any branded non-woven fusible. You surely got that I am on the side of woven interfacing. I use it for almost all my sewing projects whether it be clothing, bags or accessories. Great tips, I’m Spanish and I didn’t know the difference between them and how to translate into Spanish. I’ve learn all about sewing in English! I’ll be on vacations in Spain really soon , I can’t wait ! I’ve never interfaced that much length of fabric in one piece. The bubbles might be caused by some areas not being fused properly (but I guess that you take care to do it well). Are you already using woven interfacing ? If not you might want to give it a try. You should also wait until the area you’ve just interfaced is totally cooled down before handling/moving the fabric to interface the next area. If you move it while it’s still hot, the glue might not be perfectly set.